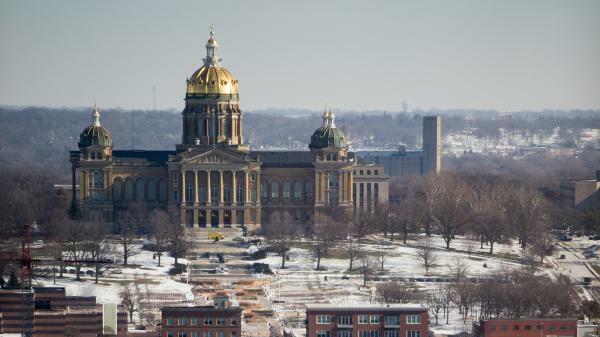 A Senate committee at the Iowa State Capitol was considering a bill that would have removed the permit requirement to obtain and carry weapons, but the chairperson now says it's a bad time for that legislation. There are thousands of gun-related bills in statehouses — some would expand access to guns by easing permit restrictions and others aim to take guns out of the hands of people with domestic violence convictions, mental health issues or others who pose a threat. The recent shooting at Marjory Stoneman Douglas High School that killed 17 has pushed some statehouses and state candidates deeper into the gun debate. Some are moving to bury bills that were already in the works, while others are gaining traction on measures that previously languished. Here's a look at some of what's happening in statehouses across the country. California claimed a victory on Tuesday, when the U.S. Supreme Court punted on a Second Amendment case once again. It declined to hear a challenge to that state's 10-day waiting period to buy guns, reaffirming that states have wide authority to set their own gun laws. Kentucky legislators say they won't consider gun control proposals, but a bill allowing teachers and staff to be armed has gained traction, as Louisville Public Radio's Ryland Barton reported. The bill would allow schools to tap teachers and staff as school marshals, as long as they have a conceal-carry permit. In Iowa, the Senate advanced a bill one day after the Parkland shooting requiring school districts to create active shooter safety plans, Iowa Public Radio reports. A Senate committee was also considering a bill that would have removed the permit requirement to obtain and carry weapons. The chairperson now says it's a bad time for that legislation. "It makes me sick what happened down in Florida, but with that said, I did have the votes to move this thing forward and decided after the communication from the governor ... to pull it off the agenda," said Brad Zaun, a Republican from Des Moines suburb Urbandale. An Illinois lawmaker has drafted a proposal in response to Florida's shooting to ban so-called "ghost guns," which are assembled by individuals outside a factory or store. Rep. Martin Moylan, a Democrat, says he also plans to file a measure that would ban AR-15s, a popular semi-automatic rifle. As NPR Illinois reports, Moylan says he does not believe this proposal would be an intrusion on Second Amendment rights. "Just like prohibiting people to drive 100 miles per hour in a car, there has to be rules and control." Republican Ohio Gov. John Kasich has softened his stance on gun control in recent months and this week called on President Trump to pass "common-sense gun laws." He recounted a conversation with a friend who owns guns on CNN. "If all of a sudden you couldn't buy an AR-15, what would you lose? Would you feel your Second Amendment rights would be eroded because you couldn't buy a goddarn AR-15? These are things that have to be looked at and action has to happen," he said. It's unclear what that action will look like in his own state, though. As WOSU reports, there are 22 pieces of legislation related to guns pending in the Ohio legislature, including bills to ban bump stocks and strengthen background checks. Kucinich plans to lobby the state legislature and called for city councils to ban assault-style weapons with high-capacity magazines, WOSU reports. That will be a tough sell, though. Ohio passed a law in 2006, which was upheld by the state Supreme Court, prohibiting cities from passing restrictive gun laws like an assault weapons ban or handgun registration requirements. Kansas' statehouse was considering a bill that would have instituted gun violence restraining orders like California and Washington. The legislators say now is not the right time to talk about guns. And as KCUR's Jim McLean reports, a Kansas congressional candidate Tyler Tannahill drew criticism online after he decided to go through with a giveaway of an AR-15 rifle, similar to the one used in the Florida shooting. Tannahill also touted a training program for arming teachers. Nearly 50 gun-related bills have been introduced in Michigan since January 2017, the Detroit Free Press reports. The majority of those would expand access to guns and have stalled in committees. But Republican Rep. Jim Runestad tells the paper that a two bills dealing with removing guns from people with mental health issues could get a second look from his committee. "What are we going to do to make sure people who are severely unbalanced are not given access to weapons?" Runestad said. In Idaho, bills to ease gun permitting are moving forward without hesitation. These include allowing anyone 21 or older to carry concealed weapons and allowing any Idaho resident to carry concealed weapons. Iowa Public Radio's Clay Masters, KCUR's Jim McLean, Michigan Radio's Rick Pluta, WCPN's Nick Castele, KBSX's Jimmy Dawson and NPR Illinois' Brian Mackey of NPR's statehouse collaborative contributed to this report.